A federal judge in Michigan has temporarily blocked a gag order banning “all current and potential witnesses” in a criminal case involving disgraced gymnastics doctor Larry Nassar from speaking out. In her ruling today, U.S. District Court Judge Janet Neff said she was approving the request for the temporary restraining order because the plaintiffs—women who have spoken out about how they say Nassar sexually abused them—had a “strong likelihood” of success in claiming the gag order violated their constitutional rights. The gag order was put in place last week by Ingham County Circuit Judge Rosemarie Aquilina in one of the several criminal cases involving the former doctor for the USA Gymnastics national team and Michigan State, who’s been accused by multiple women of sexually abusing them when they went to him for medical treatment. This criminal case in particular is not connected to Nassar’s medical work. But because of the order’s broad language, lawyers for the many women who have come forward were trying to figure out if it meant their clients had to stop speaking publicly—or even privately—about what happened. 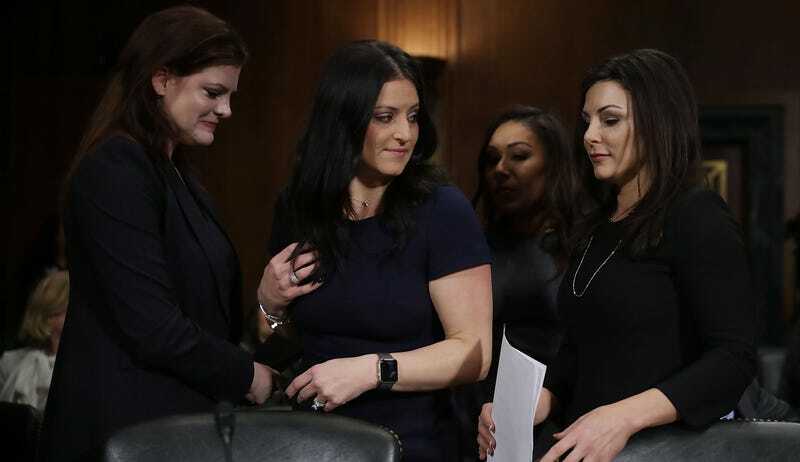 A week later, the challenge to stop the gag order was filed in federal court, citing Rachael Denhollander, Lindsey Lemke, and Jamie Dantzscher, as well as the “more than 80 alleged victims of sexual abuse” by Nassar as its plaintiffs. In her ruling, Neff wrote that the women “persuasively argue that the gag order is unconstitutionally vague, as it is not clear which individuals it actually covers and what conduct or speech falls under its scope.” She later elaborated more on that point. Here, the Gag Order entered is not explicit as to the specific persons and conduct governed, making it impossible to determine which conduct is allowed and which conduct is proscribed. Because of the vague and overbroad nature of the Gag Order, Plaintiffs are justifiably uncertain if they can continue to exercise their First Amendment freedoms, or if they do, whether they will be held in contempt. She later touches again on the concern that the order is so vague that it seems to limit even necessary, private speech about Nassar, while also pointing out that this could prevent new victims from coming forward and speaking out. Under the Gag Order, as Plaintiffs state, they are ostensibly prohibited from making any statement regarding Nassar’s case to any third party, which arguably prevents Plaintiffs from speaking about the case to anyone—including counselors and other professionals—severely limiting not only their free speech, but their ability to heal from the abuse they have suffered. Furthermore, the Gag Order may prevent new victims from coming forward. For these reasons, the Gag Order has caused and will continue to cause irreparable harm. ... Finally, a temporary restraining order on enforcement of the Gag Order would serve the public interest by protecting the rights of sexual abuse victims, and would promote public safety, particularly with respect to additional victimization. The restraining order is temporary. The next hearing on if the gag order can go forward or be tossed is scheduled for April 18. The full decision from Neff is below.